When Fromagerie du Pied-de-Vent was established nearly 20 years ago, it was a pioneer on Îles de la Madeleine. By bringing a Canadian breed of cows onto the islands, the business helped stimulate and diversify the food economy. The economuseum at Fromagerie du Pied-de-Vent was built on a genuine desire to transmit knowledge and share the cheese-makers' passion with visitors. You'll get a thorough and entertaining explanation of the various steps in cheese production. Then, deepen your knowledge even more with a farm visit to Ferme Léo & Fils, accompanied by the dairy production director, Dominique, for a total immersion in Îles de la Madeleine agriculture. The dairy by the sea continues to be involved in developing the agricultural sector on the islands. 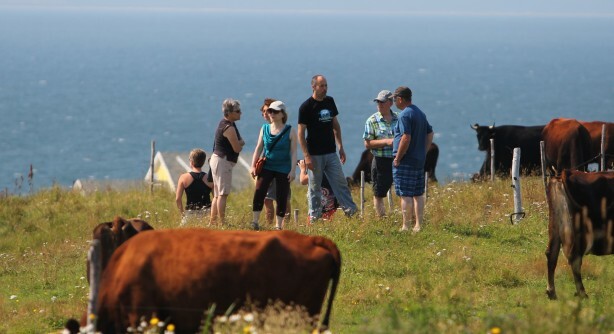 And it's not only islanders (and other Quebecers) who love what the Pointe-Basse cows produce. Every day, the boars at Aucoin des Sangliers are fed whey from the cheese production. You'll find Pied-de-Vent cheeses on every table on the islands, but make a detour to the Fromagerie itself to sample a unique cheese: Tomme des Demoiselles, which is aged with Corne de Brume beer from the À l'abri de la Tempête microbrewery. And the gourmet pleasures don't stop there. Indulge your sweet tooth with a Pied-de-Vent gelato at Gourmande de Nature. It's the perfect refreshment for a summer stroll. Forging strong partnerships with producers in the Havre-aux-Maisons area, this company is part of the Cantons Gourmands gourmet tour, along with Fumoir d'Antan and Le Barbocheux. It's a route you don't want to miss.